Baby it’s cold outside and I needed a quick warm up dinner!! It’s been unusually cold here for 3-4 days in a row now, down to around freezing at night. That just ain’t right for SOCAL!!! I also wanted something I could get on the stove quick so I could watch “Downton Abbey” I had on the DVR. I had seen this recipe on a blog I follow (The Shiksa In the Kitchen) and thought it looked good. It has one of my favorite spices, smoked paprika, which to my delight you can find readily available now. I get mine at the store and transfer it to a tin of smoked paprika I got in Spain that has long since run out. I know, cheater liar liar pants on fire, but whatever. It just helps me remember the good food, great times, and amazing people of Spain just that much easier when I see it. No magic here, just follow this recipe. Ok, I added. I can’t help it. It needed some more green and I had a bunch of kale in the fridge. I was inspired to add it by a friend, neighbor, yoga instructor who is doing a “kale challenge” and eating kale in every meal this week. Or maybe it’s one meal a day. In any case, it is a LOT of kale, but the stuff is good for you, no? Just wash, dry, strip the leaves off the stems with an upward pull, and chop the leaves. I added them as the last ingredient to go in. 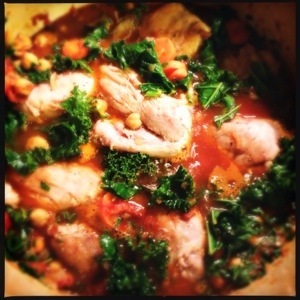 This entry was posted in Dinners and tagged chicken, chickpea, Smoked paprika, stew. Bookmark the permalink.